Today is Friday the 13th! Not for one instant do I believe in “luck;” however, why is it I even notice the calendar lands on a Friday with the numeral 13? Odd, isn’t it and has absolutely nothing to do with this FUN five minute challenge! 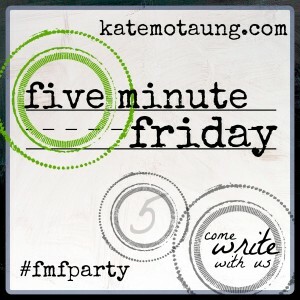 The flash mob of writers over at Kate’s have been given the word prompt – WHEN! Isn’t it odd how The God of the Universe, who is outside of time – is so into it? Let me explain. And yet, almost every Bible book opens with the “when” of the story. My “when” and your “when” matters a great deal to God (who knows no WHEN) – because I believe with all my being that not one of us is here by chance – I don’t believe for a moment that God looks at us and sometimes thinks, “Hmm, I should have put her somewhere else – in another place, another time, another “when”. And, I also believe that each one of us has an Esther 4.14. And who knows but that you have come to the kingdom for such a time as this and for this very occasion? The Great I AM, who is without a “WHEN” – is very concerned with the ‘when’ of me. Of, you. This is beautiful. I love the direction that God took your writing to say that our when and God’s when may not always match up, but He still has a purpose for us! I love it! We do all have a purpose for Him in this world if we choose to see it and accept it. You deserve the whole pan!!! Thanks Christine! Oh I love this Susan! God has been speaking to me about Time and this just goes right alongside what He’s been saying! Great post, my friend! You are kind, Karrilee, this was such a feeble post (IMO). I needed this reminder. God put me where I need to be! I enjoyed how you used this prompt my friend! Love that John 1:1 verse! Tara, glad to see you – been missing you. Hi Susan … don’t you love how much can come pouring forth in all of about 300 seconds? And a brownie is good, too! Linda! 300 seconds – wow – I like that breakdown of time. When i saw the word I didn’t know what to write. I love how you let your fingers type and come up with something beautiful and thought provoking. Thanks for sharing your thoughts. Amanda, not sure it always makes sense…but that’s what free-write is, yes? It is good to provoke our thinker, Margie!!! I have to say I’m really sorry to be commenting so late on this FMF of several weeks ago. You were my neighbor that day and I realized just now I’d never visited!